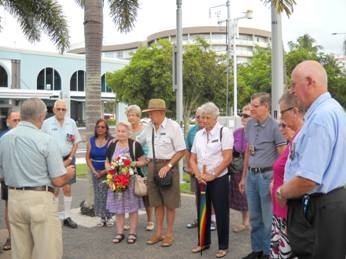 Dear all today was a great morning for the 16 members of the RAAFA Cairns Branch that attended the Bomber Command ceremony 2014, the morning tea was wonderful and as usual Cairns RSL staff look after us all extremely well. 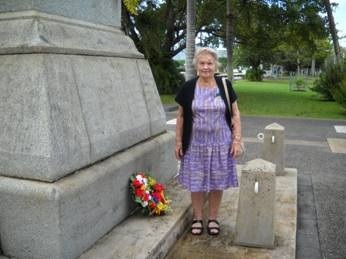 Our thanks to the President of the Cairns Sub-Branch RSL David Clifton, Secretary Lyn Warwick Cairns Sub-Branch RSL and the executives for their support. and the wonderful catering staff the Cairns RSL is a fantastic club that rates at least a ten star place in the hospitality arena. Also a special thanks to Beatrice Cranwell as with out her photography skills we would not have a record of this national event, Photos by Beatrice Cranwell Committee Member. The wreath was played by Daphne Jackson Wife of the late Flying Officer William (Bill)Jackson WWII Bomber Command Veteran assisted by Brian Fowler, it was a very moving ceremony as, 2013 ceremony was the last ceremony for Bill Jackson he past away soon after. The Video below is of the Ceremony held in Canberra on the day of the official event. Australians who served in Bomber Command have been commemorated at a service at the Australian War Memorial. All 9 of us had a wonderful time The service was fantastic and was the morning tea after the service, the following members carried out the official duties regarding the commemorative ceremony. 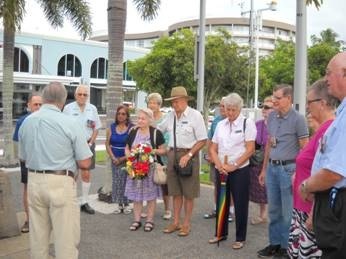 We all retired to the Cairns RSL Sub-Branch for morning tea, and a special thanks to the staff of the RSL it was a fantastic feast from the side of the Chefs’ and greeted by the dining room staff fantastic friendly service as always. We were treated like royalty by all staff members both kitchen and dining room alike a very special thanks to all. Very much appreciated from the RAAFA Cairns Branch Members and Executives.